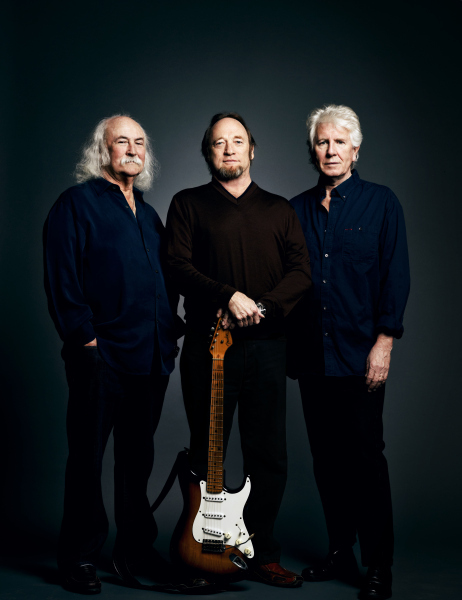 Crosby, Stills, and Nash opened at Wolftrap’s Filene Center on July 3, by greeting the crowd and receiving a standing ovation from their adoring fans. They sang to a sold out audience of young and old. Even the lawn area was full of their admirers. The first number, “Carry On” was performed by Steven Stills as the lead singer and the next two songs featured Graham Nash and then David Crosby on lead vocals. They sang their hit, “Just A Song Before I Go”. They mixed old songs and new ones and the patrons loved it all. Some songs featured only two singers while others were performed as solos. Whatever the mix, the audience relished each song. Steven Stills laid down some hot licks to thunderous applause. Graham Nash performed on guitar, keyboard, harmonica and even tambourine. He is an accomplished musician and singer, who did not disappoint the fans. David Crosby played several different guitars and sang beautifully. His vocals and musical talents are as good today as they were when the band originally formed in the late 1960’s. They played for over an hour in the opening set and upon their return, after intermission, continued to rally the crowd with a mixture of treasured songs for the next hour and a half. Graham Nash introduced the backup members of the band and gave a brief history of those men. The organist was Todd Caldwell. His chords were well defined. The drummer was Steve DiStanislao and he kept the guys on beat and the fans on their feet. They stole their bass guitarist, Kevin McCormick from Jackson Brown, so Brown’s act is “Running On Empty”. Another guitarist, Shane Fontayne was originally with Sting and Springsteen. He is a local boy who is originally from Reston, Va. and complimented the band skillfully. The last member introduced was their keyboardist who is David Crosby’s son, James Raymond. He is not only a gifted man at the keys, but writes music, too. He co-wrote, with his father, “Lay Me Down”, which is the first track on a new release. To paraphrase Graham Nash, “James has the job because he can play” and he certainly can! Steven Stills played riff after riff that left the crowd screaming for more. He threw his used guitar picks to the fans that had leapt to their feet with appreciation of his immense skills. He is acclaimed to be one of the top 30 guitarist of all time by Rolling Stone Magazine and deservedly so. They played their classic hits like “Southern Cross”, “Love The One Your With”, “Marrakesh Express, and “Our House” during the evening. They closed to tremendous applause of appreciation with a standing ovation and came out for an encore playing “Suite: Judy Blue Eyes”. It was a fantastic rock ‘n roll show presented by guys who still know how to rock the crowd. Catch CSN live and leave happy. Wolftrap scored big by having Crosby, Stills and Nash. “The Wizard of Oz” never sounded so Good!